Now that Katniss Everdeen (Jennifer Lawrence) and Peeta Mellark (Josh Hutcherson) have survived the Hunger Games and symbolically spit in the face of the reigning power of the Capital and President Snow (Donald Sutherland), they have given the down-trodden population of the outside Districts hope… Hope that there is something beyond the oppression of the Capital. Hope that undermines the fear that Snow uses to keep them under foot. And for Snow, this will not stand. Snow quickly threatens Katniss into a state of complacence where she is to be the face of the Capital and spout shallow, comforting words to the people of the districts. But when a revolution simmers with Katniss as the inspirational symbol of freedom through the Mockingjay, President Snow has no choice but to somehow take out Katniss Everdeen — but how can this happen without inciting an all out class war? In comes Plutarch Heavensbee (Philip Seymour Hoffman), the new game designer, to create a scenario: to celebrate the anniversary of the Hunger Games by bringing surviving Hunger Games contestants back to fight once again. I feel that Catching Fire is indeed a step up from the original Hunger Games. The stakes are higher on all levels. The unsettling cries of the districts are being heard by the Capital and the response is to enforce military actions while at the same time placating and distracting the masses with the media and Stanley Tucci’s brilliant teeth. The parallels between this fiction and our reality are so close and so transparent that only the densest (adult) viewers will miss the message. Likewise, the danger in the Hunger Games playing field has increased. The competitors are no longer children. And not only that, they are the survivors from previous games. So really, its the Hunger Games dream team. I feel that they could have examined the strategy and tactics of these characters a little further, and it felt like we were losing people left and right without any consequence (I suspect we gained deeper character insight in the book). But, at two and half hours, they probably made a good choice to focus more on the big picture of the political strife that that the Hunger Games are a distraction from. Thinning out the characterization of the contestants is forgivable however, given that one main theme is to remember who the enemy is (in fact, its on the poster): the political puppetmasters, and not the perceived enemies on the ground who have been forced into a survival situation where the only beef you have with someone is that they happen to be trying to kill you…for the same reason. A clear parallel to the modern day intertwined relationship between politics and military. 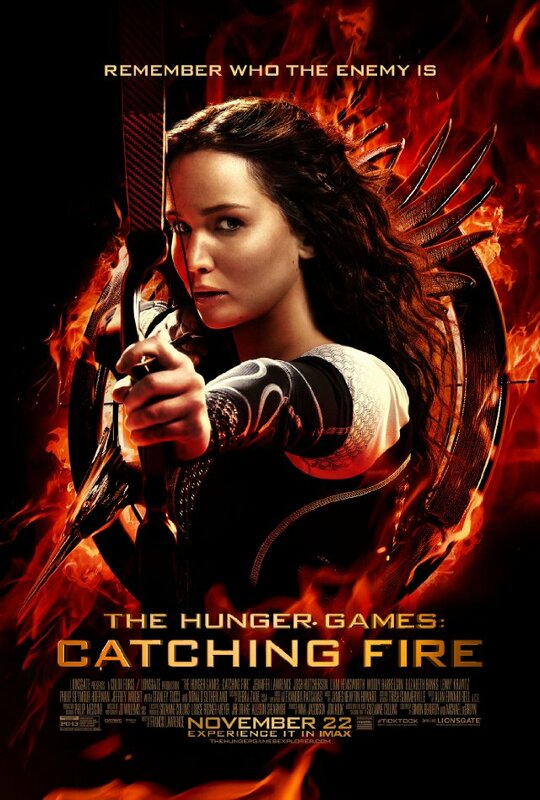 In Catching Fire, that message is strengthened because the most deadly situations Katniss and friends have to face are ones unleashed by gamesman Heavensbee. The story feel a little draggy in the first act because of the how much setup has to happen before the real games begin, and the games feel comparitively short. But once it gets going, things are kept taut, and the temporary resolution is quite satisfying. The ultimate resolution is not so much a resolution as a bridge to into Mockingjay films– which will be broken up into two films ala Harry Potter and the Deathly Hallows and Twilight what-ever-its-called. You can think of the ending as Luke and Leia watching the Lando fly off in the Millenium Falcon — but with much more gravitas, drawn deeply into a closeup of Jennifer Lawrence’s steely eyed embodiment of Katniss Everdeen. Production is top notch with Francis Lawrence (no relation to Jennifer) taking the reigns from Gary Ross, and Director of Photography Jo Willems taking the camera away from Clint Eastwood’s go to guy, Tom Stern — as well as 2nd unit director Steven Soderbergh!! who couldn’t keep the camera still long enough to see anything. Willems keeps the camera moving, but at a much more reasonable pace and the moves feel motivated. And, he is not afraid to dwell on Lawrence’s soft features and let her do her thing. The photography shifts deftly between styles of the districts, the Captial, and the Hunger Games playfield — but most notably in scenes with Stanley Tucci and Toby Jones as TV hosts and announcers. The treatment of those scenes feels like television, which hammers deeper the message about its use as a distraction and a facade. On the visual effects side, lead houses Double Negative and Weta Digital provided fantastic work, as always. And I’m sure support FX houses which include FuelFX, Hybride, RodeoFX, Creative Cantina, Whiskytree and Method had their share of work to do. Work all around was great — both visible and invisible, much of which had to have been deceptively complex. A couple janky comp shots near the end — but it didn’t ruin the show for me. Overall, I would prematurely consider The Hunger Games: Catching Fire the Empire Strikes Back of the series. It’s strong than the original. It ends without a real ending. There is a lot of strife and downnotes. And there are tons of questions posed that now need to be answered. As long as returning director Lawrence and new writer Danny Strong don’t introduce the equivalent of Ewoks in the Mockingjay films, we should be good for another round of Katniss and Peeta.